At John Muir Middle School, the fundamental goal for each one of our students is to gain the academic skills needed to carry out our simple mission and vision—we want them to be future high school graduates. We want them to be college bound. We want them to be lifelong learners. We give them the tools, resources, and knowledge they need to become academically successful and develop into people of character. CUSD will become a “Destination District” where people are drawn to Corcoran due to the quality, reputation, and accomplishments of our schools. Each student will finish eighth grade ready to successfully pass the academic classes required for high school graduation so they can graduate with a diploma from CHS. After high school, each student will have opportunities to choose a training program that will allow them to get a job that will afford them the basic necessities. We want our graduates to earn enough money to afford the basics in life like food, utilities, a house, a car, vacations, etc. and be a productive citizen in our democracy. College can mean any major state university or college like College of the Sequoias, Fresno State, or Stanford University. But the state of California also has a number of reputable trade schools, business colleges, and tech schools that offer valuable degrees in many areas of interest. Students with a certificate of training or a degree will make a significantly better financial living than those without a high school diploma. Every student will want to continue to learn after formal schooling. Technology changes regularly in the 21st century. Our students must be able to learn new things for almost any job they will encounter as adults. We want our students to develop character that will make them trustworthy people whom others can count on in life. The six pillars of character say it all: Trustworthiness, Respect, Responsibility, Fairness, Caring, and Citizenship. 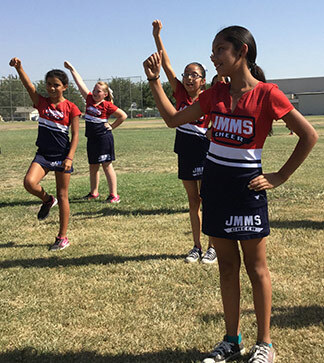 JMMS works closely with the schools in our district to unify our goals and vision of a great future for all the students in the Corcoran Unified School District. We will endeavor to create a positive learning environment where all students learn, achieve academically, and are motivated to realize their full potential in and beyond the Corcoran Unified School District.